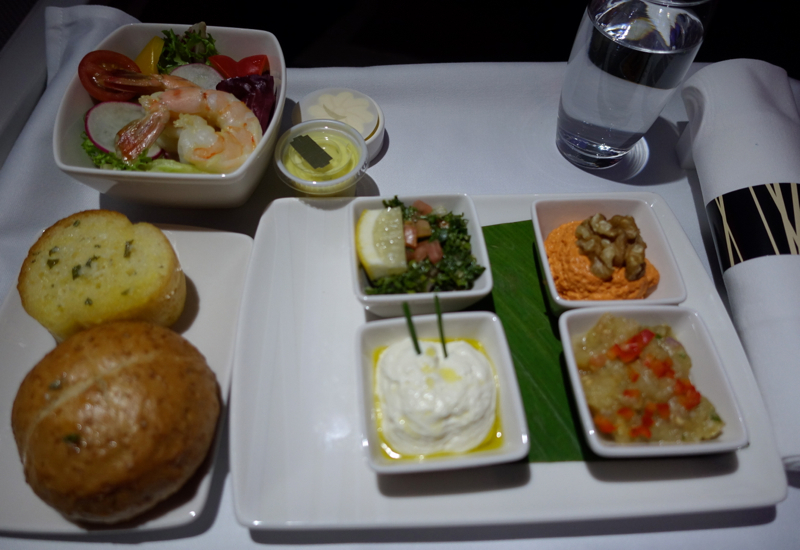 This Cathay Pacific Business Class Review, A330-300 from Dubai to Hong Kong is part of a round the world trip report including first class and business class flights, luxury hotel stays in London and Asia, and restaurant reviews. We had a late flight out of Dubai that was supposed to depart just after midnight, so it was a very good thing, given that I was traveling with my 6-year old, that we had been able to catch up on some sleep at the Park Hyatt Dubai earlier that day. 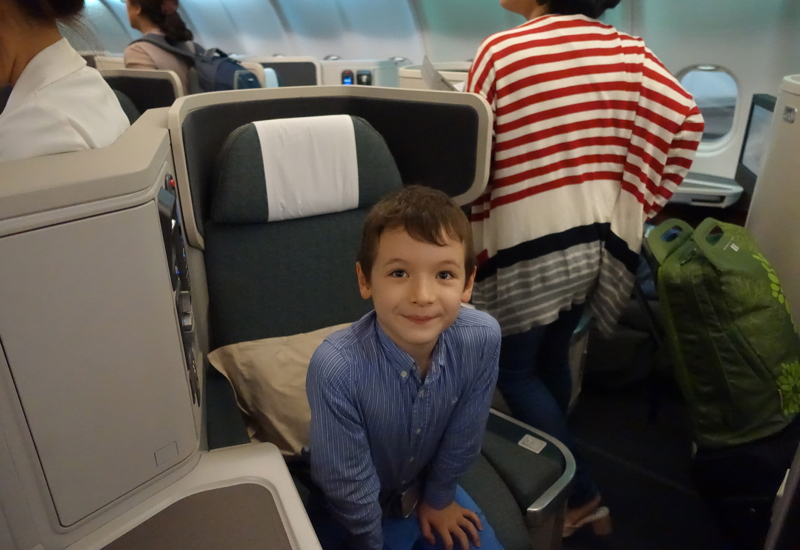 I was also glad that our 7 hour Cathay Pacific business class flight was on an A330 with fully flat bed seats in reverse herringbone configuration, and not on one of Cathay's regional flights with angled flat seats (although we did have one of those flights later in our trip, review in a future post). 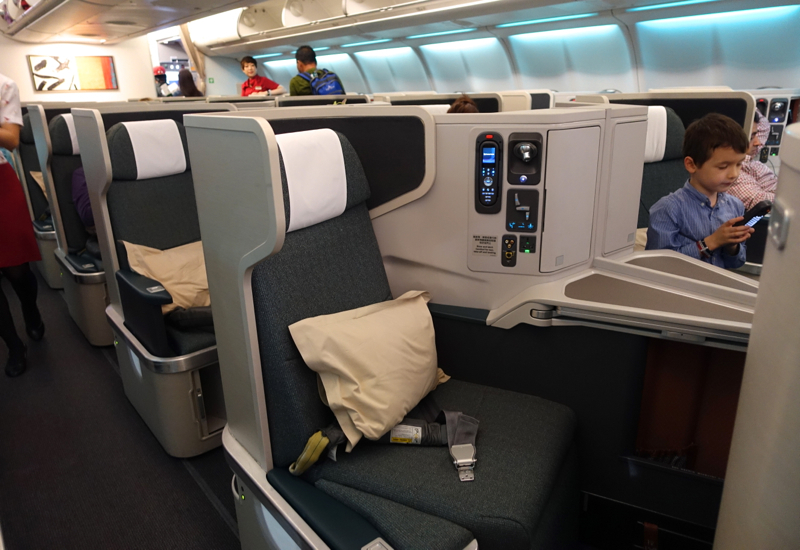 Cathay Pacific business class on the A330-300 features 39 flat bed seats in reverse herringbone configuration, each seat with direct aisle access. It's great for privacy, so even if you're traveling solo for business and end up in one of the “companion” seats in the middle, there's nothing to worry about, since you'll barely see your neighbor. By the same token, however, it's not as easy to be social if you are traveling with a partner, since you have to actually both lean forward to be able to see each other. I opted to try out the companion seats for purposes of this review, but I regretted it every time I needed to help the munchkin with something, whether with his seat, his food, etc., since I had to go around through the galley to his seat, it was too hard to help him from my seat, and you'd have to be a Chinese gymnast to jump from one seat to the other over the center divider. I would suggest avoiding the very front row, row 11, due to its proximity to the galley and lavatories and also has designated bassinet seats for 11A and 11K, as well as row 18, which is also close to a galley and lavatories, and the last row of business class, row 21, which is close to Premium Economy bassinet seats. 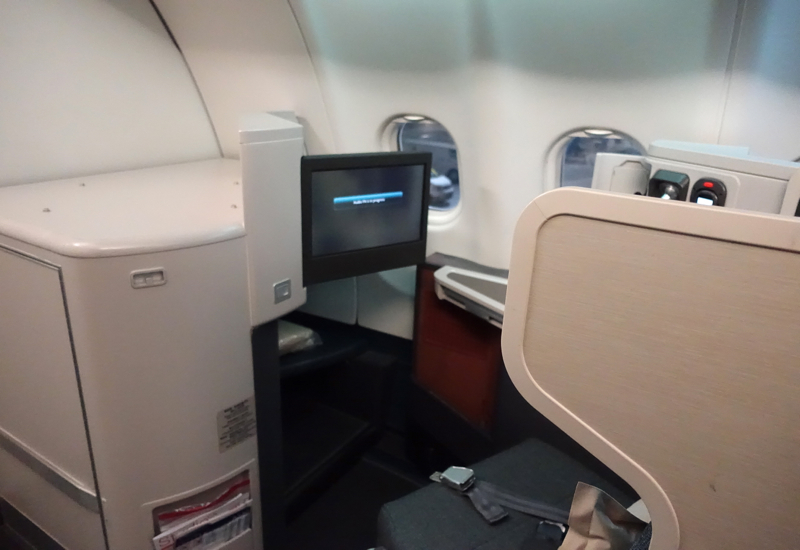 Cathay Pacific has one of the best business class seats, as long as you get its flat bed business class in reverse herringbone configuration, found on the A330-300 three class (33G), Boeing 747, and Boeing 777-300ER. As mentioned above, these are very private seats, with a tall shell around them and direct aisle access, since each seat angles away from the aisle, so there's never any issue with stepping over your neighbor. The main complaint tends to be that, as with most business class seats (apart from Singapore Business Class) the seats are narrow, so some folks do get claustrophobic in these seats. And due to how private they are, they really don't lend themselves all that well to traveling with a partner, even the middle “companion” seats. 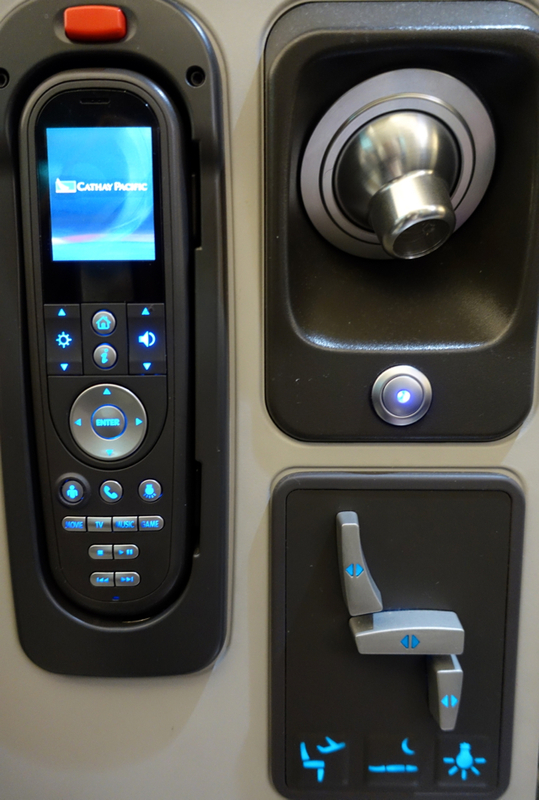 Personally, I'm happy that the seat controls are manual and not touchscreen. It takes seconds to recline your seat into bed mode–more on the comfort of that later. 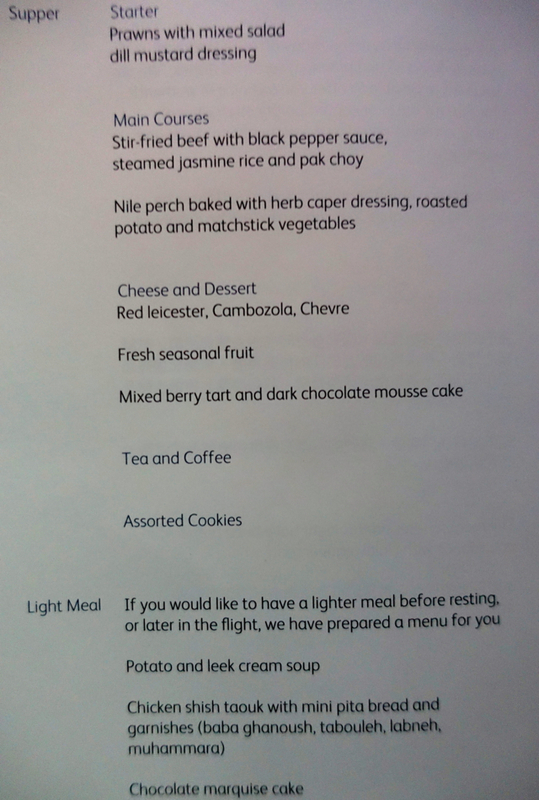 We were quite delayed in taking off due to one of the passenger's medical issues, and this is when I really started to regret not eating even the decidedly mediocre food offerings in the British Airways Galleries Lounge. 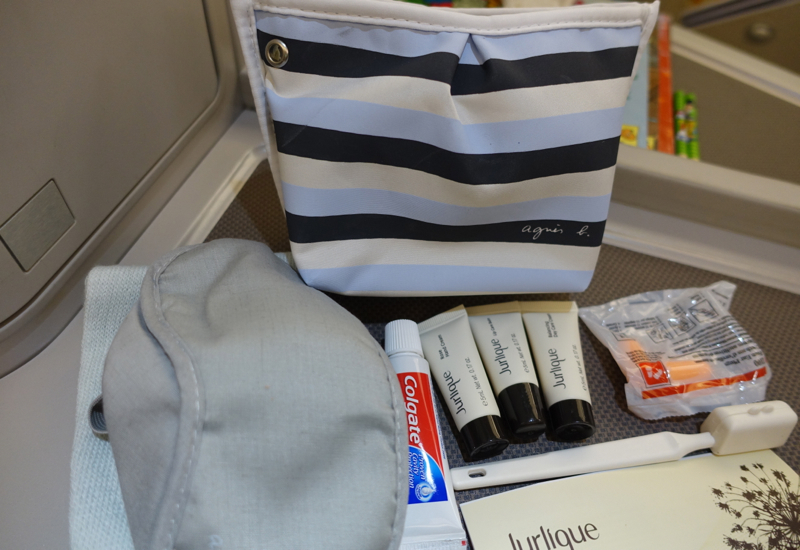 I asked one of the flight attendants, who were all clustered in the gallery, if there was anything we could eat. She looked confused, but conferred with one of her colleagues and agreed to give me some soup. I asked if there was any cheese, and she agreed to bring some of that too, as well as a small fruit plate. The soup tasted like an instant soup mix, but it was hot (scalding, in fact) and I was famished. The cheese plate featured Red Leicester, Cambozola and Chevre, and since the last two were too strong tasting for the munchkin, I had those and he had the Red Leicester. 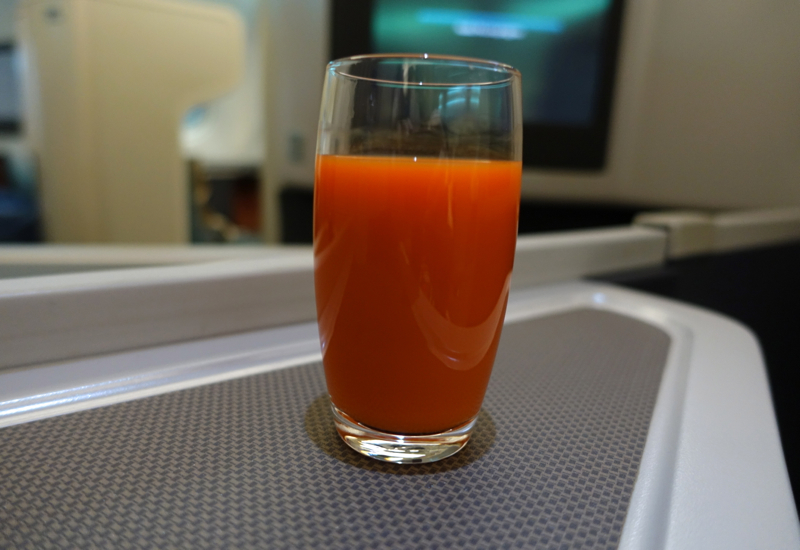 The fruit was ok, although neither of us eat cantaloupe or honeydew melon, which seem to always make up half or more of the fruit on airplanes, perhaps because it's so cost-effective relative to other fruit options. 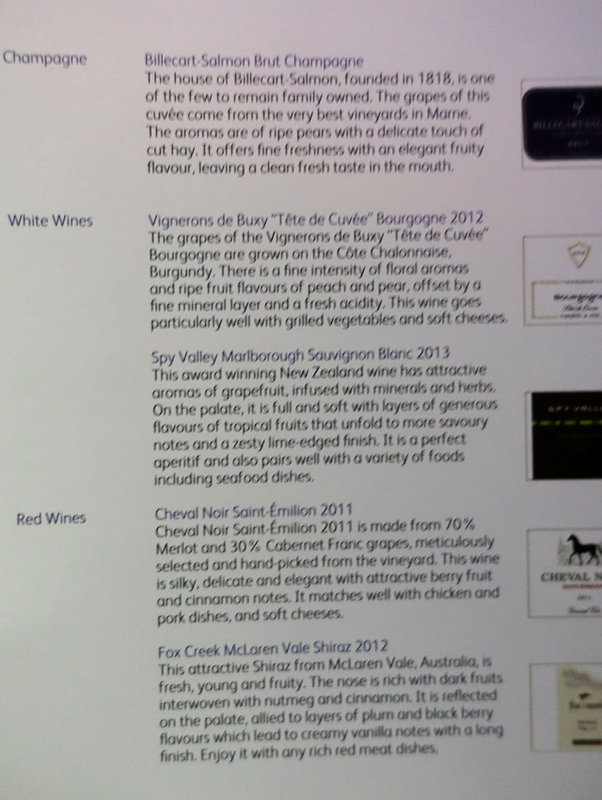 This was the wine list, although I didn't have any since I was focused on just having enough food to be able to get to sleep and then sleeping. 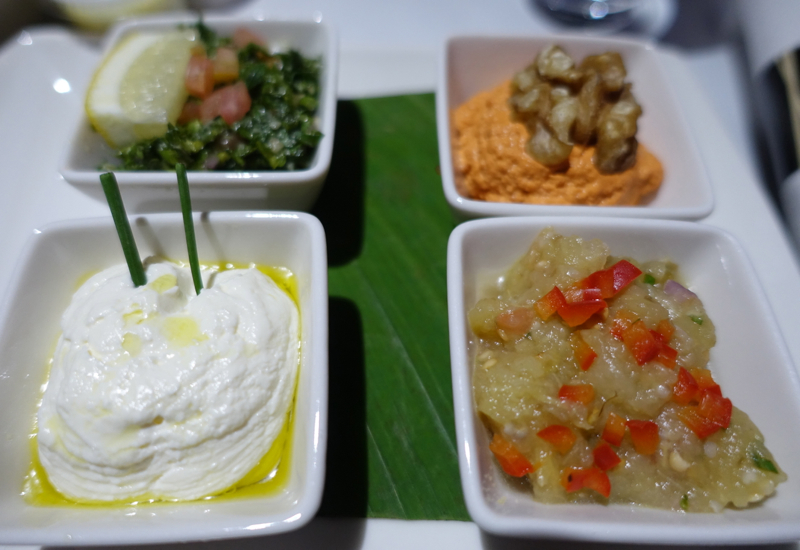 The Middle Eastern dips included baba ghanoush, tabouleh, labneh, and muhammara. I'd never heard of muhammara dip, but later looked it up. It's originally from Syria and includes Aleppo peppers, ground walnuts, breadcrumbs and olive oil. It was actually my favorite of the dips, although the thick yogurt labneh was also very good. I've had better tabouleh and baba ghanoush, however. 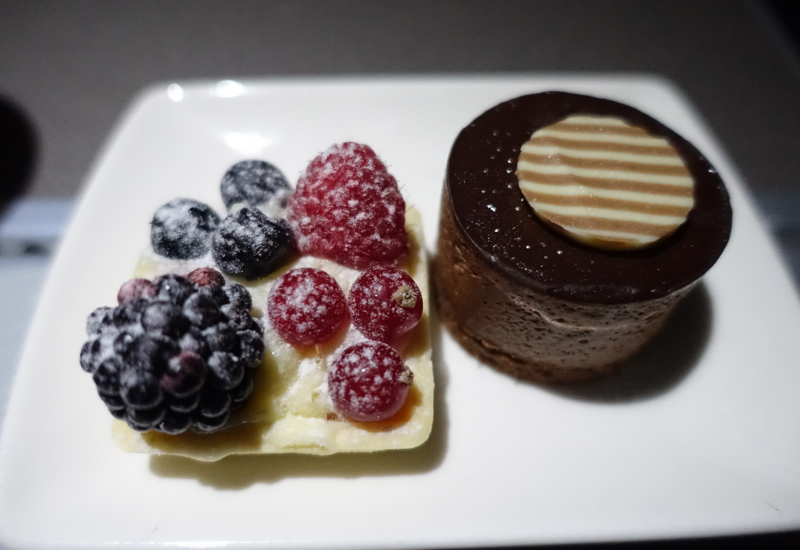 I finished with a dessert of berry tart and chocolate mousse cake which were nicely plated but forgettable. 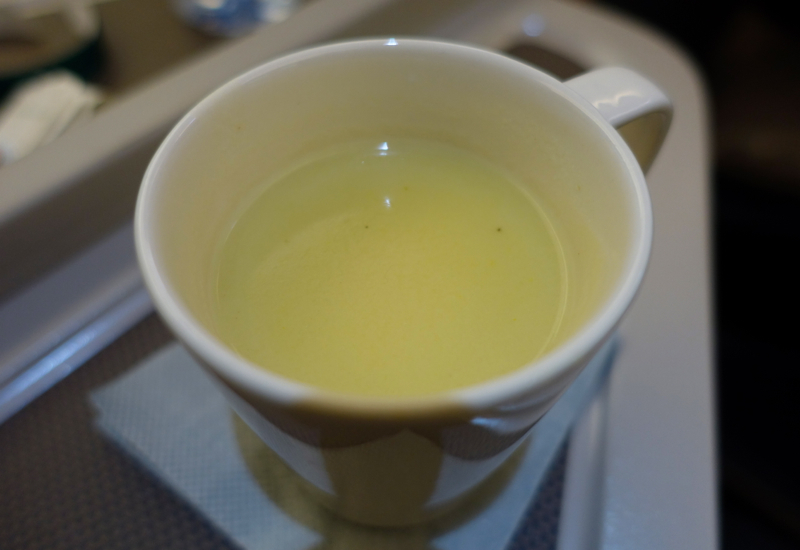 Cathay Pacific Business Class, as with most business class cabins, does not excel in dessert. 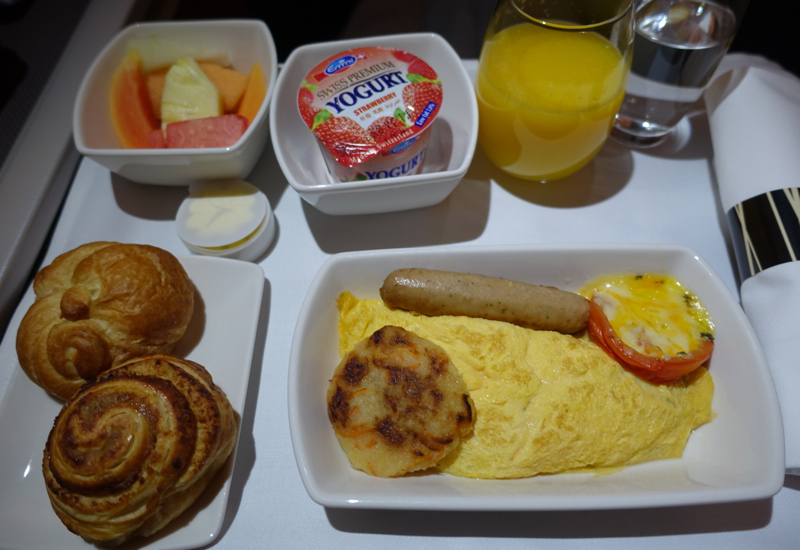 In the morning, breakfast included juice, yogurt, and croissant, and I chose the Western option of a mushroom omelette with sausage, potato rosti, and tomato. 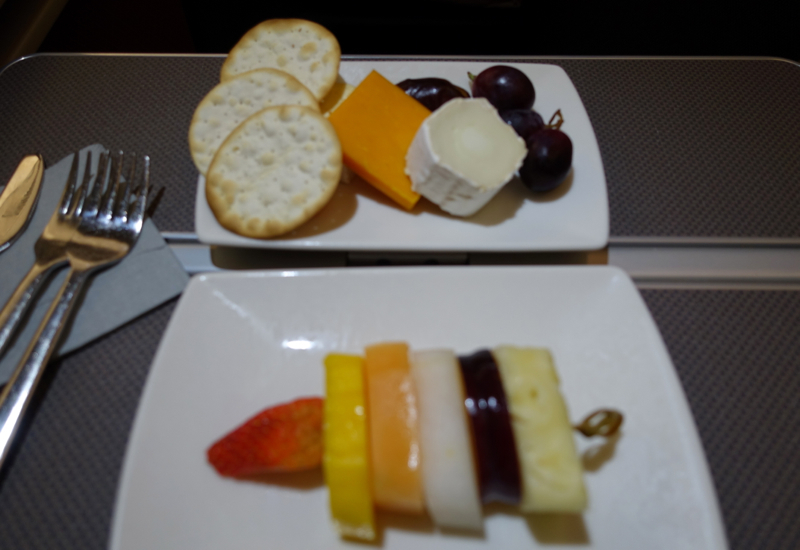 The yogurt was the best part, since it was Swiss Emmi, which is creamy and good, if not as delicious as La Ferme du Manege, which we've enjoyed in Cathay Pacific First Class. I noticed the munchkin's orange juice tasted fresh squeezed whereas mine was definitely not fresh squeezed, so apparently not enough fresh squeezed orange juice was catered for the flight and they had to supplement. Another aspect was that there was no jam on the tray, so I had to ask for it. It was Bonne Maman strawberry jam, the same as I'd had a few years back on a Cathay Pacific Business Class flight to Hong Kong. Lack of fresh squeezed orange juice notwithstanding, overall a solid breakfast offering for a business class flight. 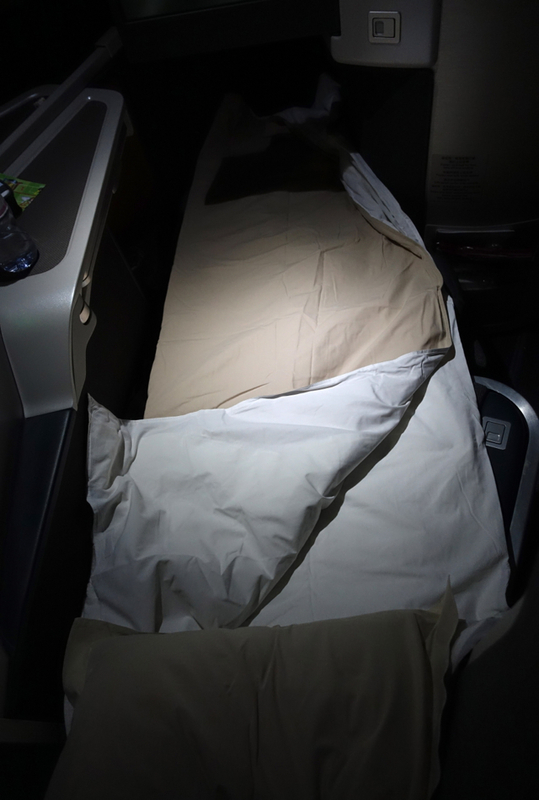 Cathay Pacific Business Class in bed mode has a usable bed length of 75 inches, which won't accommodate very tall folks who want to stretch out, but works quite well for most travelers. While I do find Cathay Pacific's old business class seat on the 747-400 to be a bit better padded, the current Cathay Pacific Business Class seat is still one of the more comfortable business class seats I've flown, after the JAL Sky Suite Business Class seat, which has its own mattress pad. I've come to have fairly modest expectations where business class service is concerned. 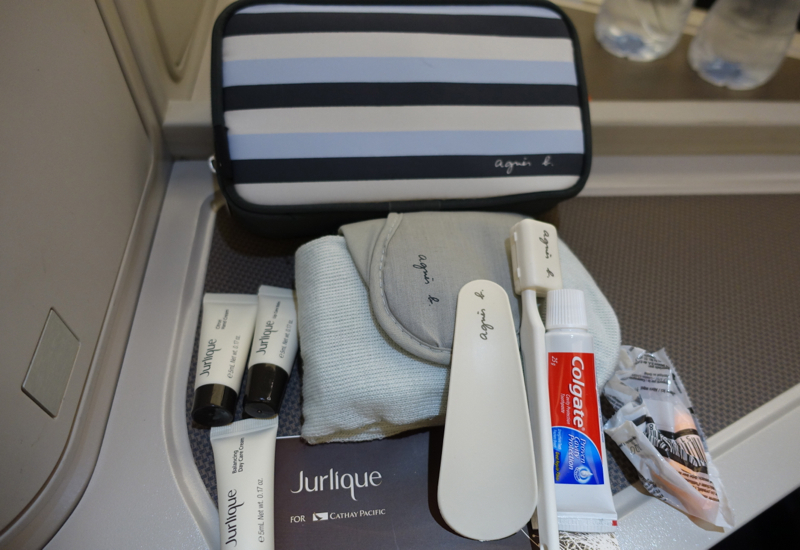 In my view, if you want excellent service, you need to fly first class, ideally on a top airline that offers first class, such as Singapore Suites, Qantas First Class or Cathay Pacific First Class. Even so, I was a little concerned by the business class flight attendants' reaction when I asked for something to eat due to our long delay prior to take-off. It was clearly something “off script” that they hadn't anticipated, and they had that deer in the headlights look. In the end all was fine, since they did provide some food for us. I've already mentioned a couple other things that were forgotten, such as the chicken part of my light meal until I asked for it, and jam until I asked for it. 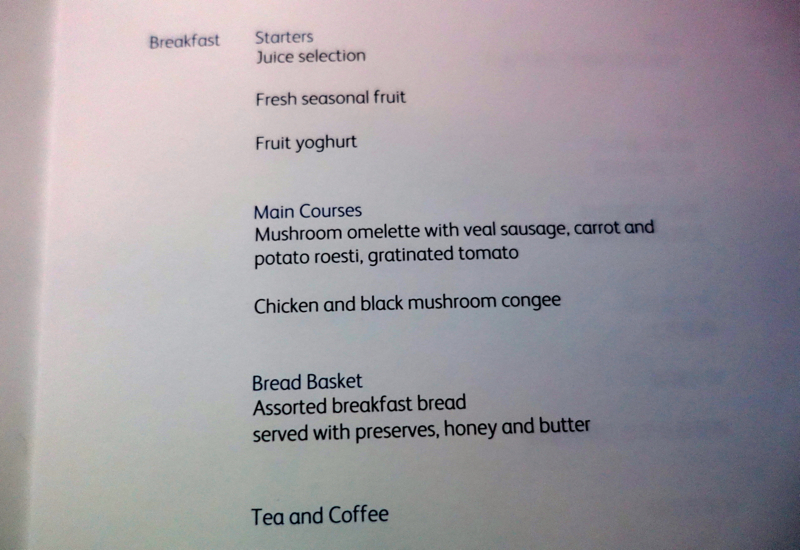 I also had to ask for breakfast, even though flight attendants were busily going up and down the aisle serving some other passengers. I'm ok with this, but it's just important to set expectations to not expect proactive service in Cathay Pacific Business Class. 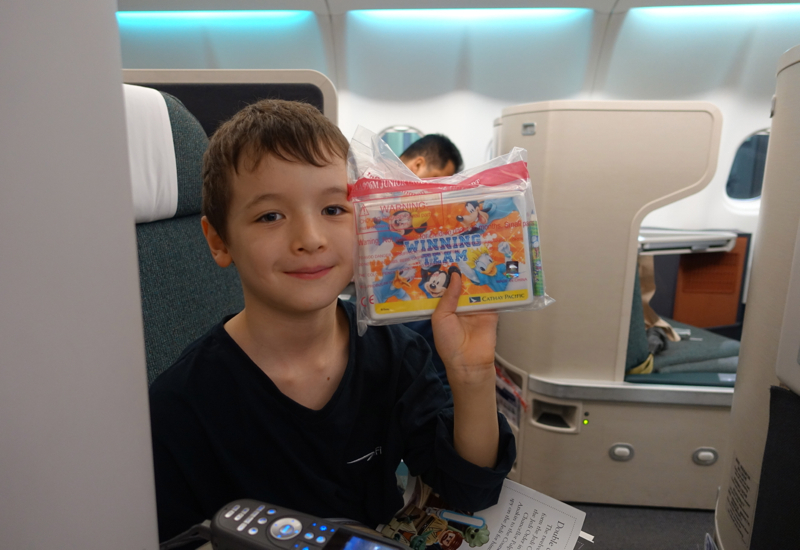 Fly Cathay First if you want a more seamless experience. That said, it was nice that they did give my son a Disney themed kids' welcome amenity. It helped occupy him during our delay on the tarmac. Apart from our delayed departure, which of course was beyond the control of the pilot and crew, our Cathay Pacific Business Class flight was what I've come to expect from Cathay Pacific Business Class: an excellent hard product including a private and comfortable seat, but hit and miss soft product with somewhat inattentive service and forgettable food, although the kid's Disney welcome amenity was a nice touch. 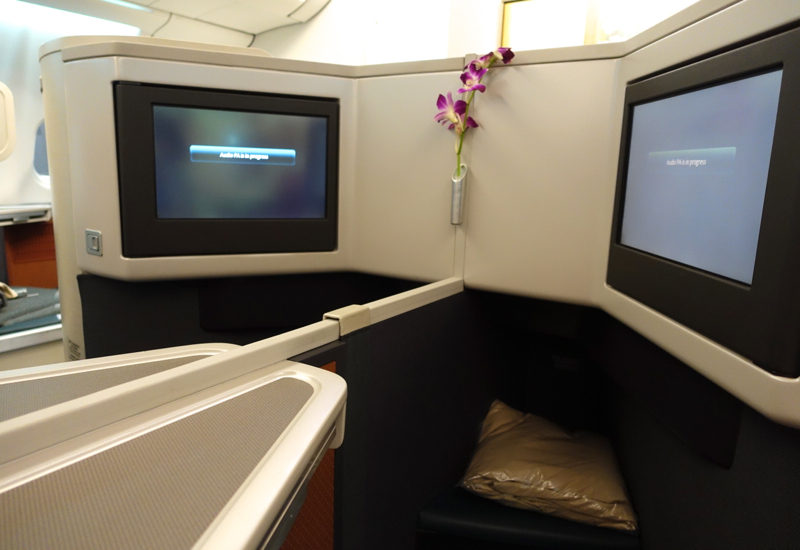 If you've flown Cathay Pacific Business Class on the A330, what was your experience? Disclaimer: Note that some cards in this post offer credit to me if you’re approved using my links. The opinions, analyses, and evaluations are mine. This content is not provided or commissioned by Chase, Barclays, American Express, Citibank, US Bank, Bank of America, or any other company. They have not reviewed, approved or endorsed any of my articles.